Necklace with invisible closure, stainlessteel. 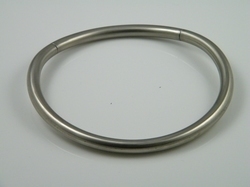 This necklace is made from round hollow stainless steel. The rear section can be taken out for easy getting it on. Once on it is almost impossible to see where the sections come together. Easy to wear because of the low weight . Optional there is a slide-over ring to give your necklace a fully other appearance.